This guide is available to download as a free PDF. 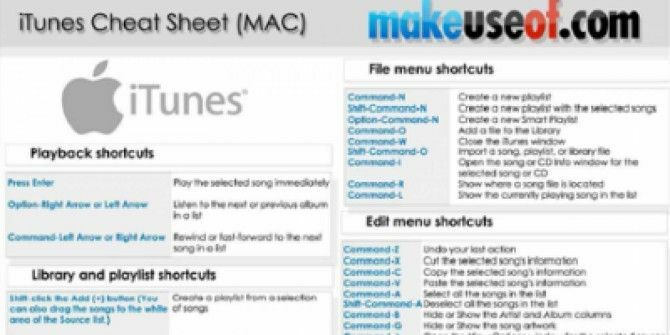 Download iTunes Cheat Sheet (Mac) now. Feel free to copy and share this with your friends and family. You may use keyboard shortcuts to quickly accomplish most of the tasks in iTunes. While the shortcuts for most of the common commands available in the iTunes menus (as well as context menus) we thought it might be easier for you to get them on a printable single A4 sheet. Let me highlight a few to give you an idea of what kind of shortcuts are available. For instance, to play the selected song immediately you may use the ‘Return’ button. Shift-clicking the Add (+) button creates a playlist from a selection of songs. Option-Delete button combinations will delete the selected song from your library and all playlists. Explore more about: Cheat Sheet, iTunes.